Last week, as the Dow Jones Industrial Average fell to a 12-year low, coverage of the ever-worsening economic crisis shifted again to yet a new narrative. Led by falling stock prices, the financial meltdown accounted for 43% of the newshole from March 2-8 as measured by the Pew Research Center’s Project for Excellence in Journalism. That is up modestly from the previous week when the story registered at 38% of the newshole. In the six full weeks since President Obama’s inaugural—January 26-March 8—the economic crisis has accounted for 43% of the newshole. 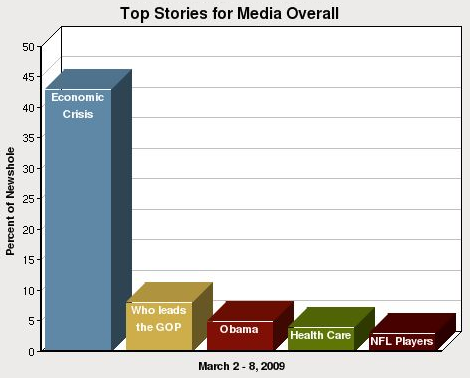 (And that does not include related stories, such as the U.S. auto industry or Obama’s February 24 speech to Congress.) That is roughly six times more than the next biggest story—the logistics and evaluations of the new administration—which registered at 7%. These numbers for the floundering economy in 2009 conjure up comparisons to the Presidential election in 2008. It is an ongoing saga that shows no signs of abating (at least the campaign had an ending date) and is consuming the overwhelming share of media attention. In the same period in 2008—one that included Super Tuesday and other key primaries—the election filled 46% of the newshole, and the economy was the second-biggest story at 6%. The numbers are remarkably similar. Aside from the sheer gravity of the situation—comparisons to the Great Depression are increasingly creeping into the media narrative—the other striking feature in the coverage is the complexity and breadth of the economic problems, which also suggest a story with massive staying power. Last week marked the fourth time in four weeks that a different component of the crisis was the top storyline. 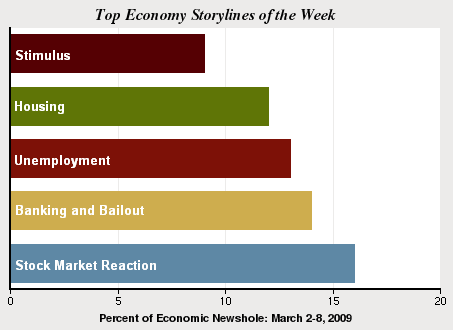 As the key player in the economy story, Obama has easily been the top newsmaker since taking office. But last week he shared some headlines with a subject at least partly of his own choosing. The No. 2 story, at 8%, revolved around Republican Party leadership with the focus on conservative radio talk host Rush Limbaugh. The White House and other Democrats are aggressively portraying Limbaugh as the GOP’s de facto leader, a task made somewhat easier when Republican National Committee chair Michael Steele became the latest member of his party to follow critical comments about Limbaugh with a quick mea culpa. Obama versus Limbaugh was, in many ways, a classic tale of political tactics and inside-the-Beltway intrigue. But last week, it may have offered the media—and news consumers—a bit of a distraction from pink slips, zombie banks and fleeing investors. As the Dow Jones fell more than 6% last week, the continuing carnage in the stock market was the top theme, accounting for about one-sixth of the economic crisis coverage. That was followed closely by coverage of three other elements of crisis—the credit crunch and financial sector bailout; unemployment; and the housing market. The range of these themes, and their complexity, suggest a story that will challenge the media’s ability to track them consistently and in a timely fashion. While the top theme this week was falling stocks, the previous week it was the Obama budget and deficit spending that commanded the most coverage. Before that, the lead storyline was the housing package Obama unveiled on Feb. 18, and that came after a week in which the newly minted stimulus package dominated the economy narrative. Last week, the storyline from the New York Stock Exchange was not just about new lows for the Dow. Reporters and commentators also began to speculate more loudly about whether the Obama Administration’s ideas and execution were spooking already skittish investors and depressing the falling market. A day later, after ABC anchor Charles Gibson noted that the Dow had fallen under 6600 for the first time since 1997, correspondent Betsy Stark reported that investors were concerned about Obama’s stimulus and financial sector bailout plans. “Wall Street, as one analyst I spoke to put it today, is underwhelmed by what’s going on in Washington,” she said. Some of the media coverage last week also suggested that the administration is becoming more sensitive to the psychological component of the economy—the need to build confidence among worried consumers and investors. A March 4 Associated Press story that appeared on the front page of the Meadville Tribune in Pennsylvania noted that the President and other top officials were more actively defending their policies. Last week, Limbaugh found himself part of the second-biggest story in the news when Democrats—in what was apparently a concerted effort—labeled him as the face of the Republican Party. (On March 4, the online site Politico reported that ex-Bill Clinton aides Paul Begala and James Carville hit upon the strategy after seeing how poorly Limbaugh polled among many Americans.) Limbaugh, never one to avoid the media glare, responded by challenging Obama to a debate. Limbaugh’s status was further inflated when Republican Party Chairman Michael Steele on CNN first criticized Limbaugh’s program as “incendiary” and “ugly” and then apologized to the radio talker only days later. That, in turn, spawned media speculation that Steele’s tenure at the RNC might be short-lived. Conservatives walked a fine line, attacking Limbaugh’s liberal critics, but for some Republican lawmakers, also denying that he was a party leader. “This is so typical of the old war room tactics of the Clinton administration,” declared conservative radio talk host Laura Ingraham on Bill O’Reilly’s Fox News program. “We have [Paul] Begala, we have [James] Carville, and now the new added element [Obama chief of staff] Rahm Emanuel consulting with each other,” to target Limbaugh. All this controversy may mean that more people are listening to Limbaugh. According to a March 7 Washington Post story, Talkers magazine—which monitors the industry—estimates that Limbaugh’s weekly audience of about 14 million listeners has spiked dramatically, to about 25 million, in recent days—though the piece also painstakingly noted how difficult it is to get a precise fix on Limbaugh’s actual numbers. The amount of coverage focused on Obama continues to reveal the extent to which the economic crisis has attached itself to the new President. He was once again the singular figure in the news last week. 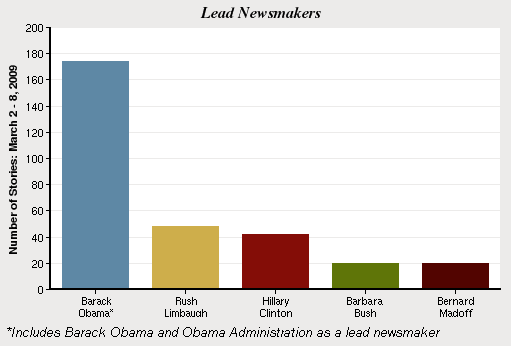 He was lead newsmaker—meaning he was featured in at least 50% of story—in 13% of the stories from March 2-8. That was a significant falloff from 20% the previous week when his speech and budget proposal helped drive the news. Some of that slack was taken up by Limbaugh, who was No. 2 at 4%. The talk host was followed by globetrotting Secretary of State Hillary Clinton (3%). Then tied at 2% were former First Lady Barbara Bush, who underwent successful heart surgery, and Bernard Madoff, who, according to last week’s media accounts, is expected to plead guilty to charges connected with massive investment fraud. With the two leading stories once again accounting for about half the newshole the week of March 2-8, coverage apportioned to the remaining top five stories was modest at best. The No. 3 story, at 5% of the newshole, was about the new administration—a narrative that included everything from Obama’s nomination of Kansas Governor Kathleen Sebelius as Secretary of Health and Human Services to the spreading crop of gray hair atop the President’s head. The fourth-biggest story, at 4%, was the health care debate, a subject that someday could consume considerably more political and media attention. Last week, Obama’s health care summit helped fuel coverage of another aspect of the President’s sweepingly ambitious agenda. But the number also showed the degree to which trying to generate public support for an issue other than the economy may be an uphill battle. The fifth-biggest story last week, at 3%, was a tragedy at sea. Three men, including two National Football League players, died after vanishing during a fishing trip in the Gulf of Mexico. Note: Due to a technical error in recording, this week’s sample does not include the following programs: Good Morning America and The Early Show from March 2, and the Ed Schultz radio program from March 5.